discharge from the Navy at San Francisco in 1970, I joined the US MARITIME SERVICES as seamen. I sailed out of the west coast on container ships. From 1970 through 1980, I worked for the City of San Francisco department of works in the wastewater dept. as a lab helper. 1980-1985, I worked for Wells Fargo Bank as armed security, transferring stocks, bonds, cash and bank papers from bank to bank. From 1985-1994, I worked for the City of San Francisco FINE ARTS DEPT. armed and electrical security. In 1992, I became disabled due to Cardiomyopathy, bad heart circulation by its muscle. February of this year, Kaiser Medical found first stages of Prostrate Cancer. A word to the wise for all male class members, have a PSA blood test on a regular basis. In April 2005 Richard Swarn wrote: "Mike Horne died quietly in his sleep in San Francisco last September. He made me promise to not broadcast the news until after his 61st birthday. Well, it has passed and he is resting on a hill West of the Presidio overlooking the mouth of the Bay." 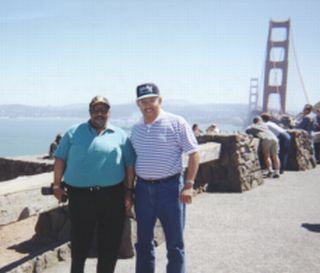 Mike Horne and Richard Swarn at the Golden Gate Bridge in San Francisco-August,2001.